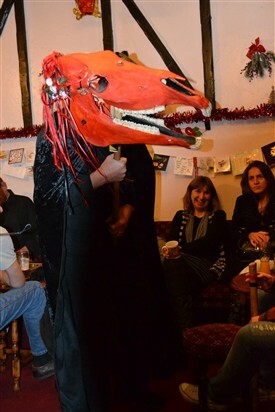 In private houses and later inns and pubs from the mid 1800s onwards, Christmas Eve would be associated with the Poor Owd Oss or Old Horse. 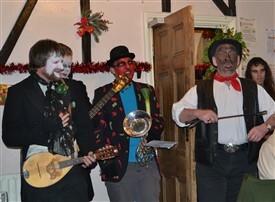 The tradition was a type of mummer’s play although mostly sung rather than acted. Its arrival was deemed to be associated with luck and as such it was rarely sent away, although it appears the custom was primarily done as a way of making drinking money, mainly by miners, on the Nottingham-Derbyshire-Yorkshire borders. “His coat it was once of the linsey-woolsey fine, His mane it grew at length, and his body it did shine, His pretty little shoulders that were so plump and round, They're both worn out and aged; I'm afraid he is not sound; Poor old horse! Poor old horse! To stand all sorts of weather, either rain, or frost, or snow; Poor old horse! Poor old horse! How old the tradition is, is unclear, it is first noticed in the 1840s and may be no older than that, although why a custom would arise in this rather insignificant period is not clear. Equally it may be that this is a period with a growth of antiquarian interest, particularly of the more academic kind, so it may happen just to be recorded then, as were other similar folk customs. Therefore, it may be considerably older and related to similar customs such as the Cheshire Souler’s play. Perhaps the record of a hobby horse at Holme Pierrepont may recall this custom but that is mere supposition. "It could have arisen in the post-Industrial period as something to do with the skulls of pit ponies to raise some money". Perhaps the Poor Owd Oss is a survival of this Winter solstice observation with this custom being a continuation of a form of pagan animal worship. However, it could have equally arisen in the Industrial period as a response with something to do with the skulls of pit ponies to raise some money. It appears that in most places the play died out just after the 1940s, although it was revived Richmond, Yorkshire on Christmas Eve, and the version there bears more relation to hunting. Nottinghamshire’s tradition was more working class in its approach. In Nottinghamshire, it was revived by the Company of Owd Oss, part of the Black Pig Morris in 2005 in the Kimberley area. At first the Oss consisted of a papier-mâché skull, then one made of railway sleepers and finally a real horse’s skull. This skull is painted red, has LED eyes and other lights. Unlike the first skull this structure does not open and close its jaw - which is a shame. All skulls are attached to a pole and carried by a man cloaked and wearing a silver death mask. The reviver of this custom was Dave Mooney who informed me that he came across the custom whilst idly reading a book on traditions in bed! That year, after the discovery of the above script recorded by Mason in 1902 and information that is was done in Kimberley, with some musician friends and Morris men revived it. They custom is only undertaken one night, usually the week before Christmas and involves visiting local pubs usually three or four a night, including in Nottinghamshire, Giltbrook, Bagthorpe, Swingate, Watnall, and Kimberley. As far as I am aware they are the only group in Nottinghamshire to enact this play and long may it continue and possibly encourage other revivals. Mason, M. H., (1902) Nursery Rhymes and Country Songs: Both Tunes and words from Tradition. This page was added by R B Parish on 02/01/2013. Poor Old Oss was performed by Black Pig Border Morris at the 2013 Falling Leaves Folk Festival at Annesley Old Church as part of the HLF funded Annesley Old Church Project (2011-2014). 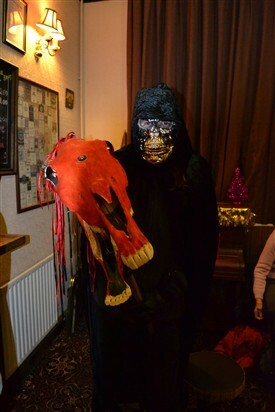 The tradition of Bullgysing or Mummers Plays is also continued in the Selston area of Nottinghamshire. In the run up to Christmas Ripley Morris Men usually perform a version of the Selston Bullgysing Play in the pubs around Selston. All benefits go to Ripley Hospital.